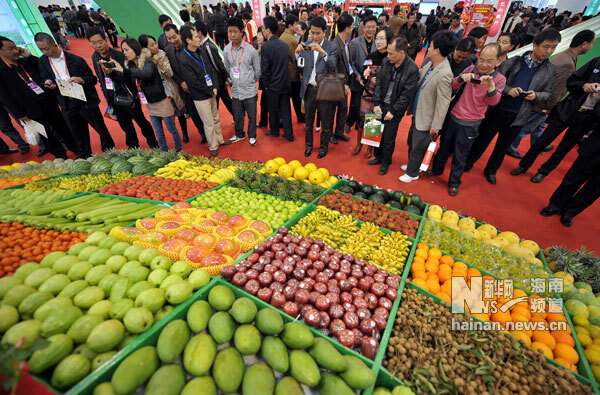 Hainan’s tropical agricultural products made hot sales at the China (Hainan) International Tropical Agricultural Trade Fair that is ending today in Haikou International Convention and Exhibition Center. As of Tuesday, a total of 2.065 million tons of agricultural products, including tropical fruit, vegetables and aquatic products were ordered at the annual fair. Among major deals, a 6.9 billion yuan deal was made on tropical vegetables sales, a 2.2 billion yuan was made on fruits sales and another 275 million yuan contract on aquatic products sales.